Goodreads Blurb: The day I turned 16, my boyfriend-to-be died. I brought him back to life. Then things got a little weird… Molly Bartolucci wants to blend in, date hottie Rick and keep her zombie-raising abilities on the down-low. Then the god Anubis chooses her to become a reaper-and she accidentally undoes the work of another reaper, Rath. Within days, she’s shipped off to the Nekyia Academy, an elite school that trains the best necromancers in the world. And her personal reaping tutor? Rath. Who seems to hate her guts.Rath will be watching closely to be sure she completes her first assignment-reaping Rick, the boy who should have died. The boy she still wants to be with. To make matters worse, students at the academy start turning up catatonic, and accusations fly-against Molly. The only way out of this mess? To go through hell. Literally. 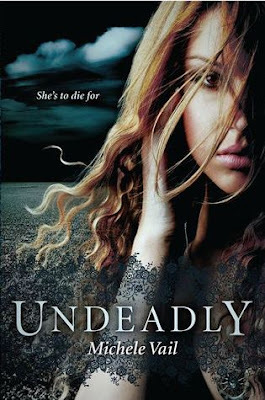 Undeadly follows a young girl as she learns that she is no longer the normal teenager that she strives to be. She is a necro. Meaning she can make zombies. But on the eve before her 16th birthday she is visited by Anubis and chooses to be in his service. What does that mean for Molly, who so wanted to be normal? Well it means her life is a bout to get very very difficult. I was surprised to find myself loving this book by the end. I had started it about a month ago and put it down to do some review requests. I was not going to pick it back up but honeslty, I had to. I loved the cover so much and the description caught my interest. So I figured I would finish it, or regret not finishing it. Molly has a tendency to piss me off. She is very immature. While I appluad the efforts that the author made to make Molly sound like a real teen sometimes they just sounded corny. Molly likes the use the world ‘killa’ to describe things (ie I had a killa room). Not a big deal, and teens probably do say this. And I would probably think it sounds stupid coming out of their mouths too. But every time Molly would start to piss me off she would come up with some super amazing sarcastic comment and I would fall in love with her again. No surprise that the real star of the show for me was Rath. I wasn’t really into Rick. But Rath…yep, he’s my kind of boy. Dark, delisicious and dangerous. He was just as sarcastic as Molly and their banter had me LOLing quite a bit. The ‘killa’ thing may bother me too ~ but I’ve been looking forward to this one so I’ll try to get over it. 😉 Nice review!